Thanks for the review. How difficult was it to install? What is the calibration procedure? I tried this on my Jet 12” combo machine, but had to return it because it only reads to 6”, but the machine planes to 8”, and you need at least 6” of clearance to switch between modes. So I got the model with the remote readout, and it has worked very well. It’s especially handy on the combo machine because you may have to shift modes in the middle of a job. 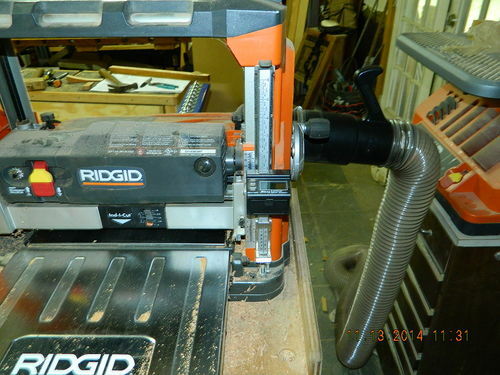 Makes it very quick and easy to return to your exact planer setting. It’s capable of metric, fractional, and decimal measures. Though I haven’t tried it, I suspect the decimal mode will give you the most precision. Trouble is, I haven’t trained myself to think in decimal measures rather than fractional. Lots of great uses for this tool. I have been tempted to get one for my router lift. Thanks for taking time to review the product for us. on my Delta Unisaw and the third one on my Jet 22-44 drum sander. precise measurements and don’t want to use calipers all the time. Looks like a nice addition eddie. Thnx for your review. I had one of these on my dewalt…great investment. simple to install and accurate. i HATE estimating how many cranks i have to go up or down to match up lumber. and, of course, using calipers. just now ordered this wr510. eddie.. my wr510 arrived today. we have the same Rigid planer, i believe… 4551? any installation comments before i try it out sunday? I’ve been looking at this as week for my Dewalt planer. All of this positive feedback means I’m gonna have to scoop one up. Thanks for the review and comments. 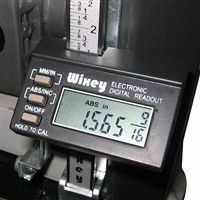 finally got around to installing my Wixey WR510 on my Rigid 4551 planer wow. Worth the investment! No more guessing on how many 1/4” turn revolutions to make everything flush. Only downside is i can not ‘lock’ down my planer height handle as the metal supports from planer head assembly to the Wixey gets in the way. Might have to do some modifications down the road.